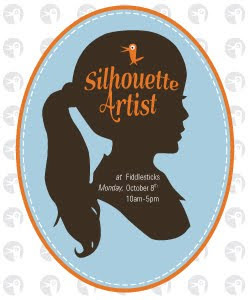 You're Invited: A Fantastic Fiddlesticks In-Store Event! We're immensely excited for Monday, October 8th, when we'll be hosting the very talented Karl Johnson right here in our shop. We hope you'll join us for the fun! Hand cut silhouettes make unique, beautiful keepsake gifts for doting grandparents and devoted aunties and uncles: criss-cross a few names off your holiday gift list early this year. Come join us on October 5th - give us a ring today (415-565-0508) to reserve your spot!